Seeing race is something we learn to do by looking along certain grooved sightlines. One of the more popular sightlines emphasizes the multiracial ensemble, generally singing or playing in harmony. The baseball team. The military platoon. And, of course, the chorus. To take a ride on the “It’s a Small World” exhibit at Disneyworld, one descends to a subterranean stream and boards a small dinghy. If you are with children, as are the great bulk of the visitors (and, indeed, like me), the first few moments are taken up with the usual details: seating assignments, safety, and photographs to capture the anticipation and realization of something magical. The music – the famous jingle that shares its name with the ride – can be heard in the distance, its chirpy cadence reduced to a gentle throbbing by dark curtains. “It’s a world of laughter, a world or tears/It’s a world of hopes, its a world of fear/There’s so much that we share/that it’s time we’re aware/Its a small world after all.” The ride starts with a lurch. And as the dingy moves forward along a route that covers the seven seas, passengers are pulled first into darkness, and then into a brightly-colored, cosmopolitan journey around the world. An example of Walt Disney’s unique utopian politics, “It’s a Small World” opened at the 1964 World’s Fair within eyeshot of the massive, stainless steel Unisphere, a symbol of a better, emerging world united by a commitment to progress and collective advancement. The exhibit, one contemporary account suggested, was the keystone to a rich corporate partnership. Ostensibly linked to UNICEF’s humanitarian efforts, “It’s a Small World” generated donations small and large from patrons at the fair; appearing in the Pepsi-Cola Pavilion, it called attention to the soft drink company’s public service efforts; and the entire affair, of course, solicited family travel to the Disney resort. 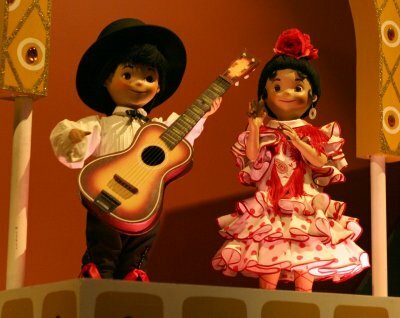 Despite charging a small admission fee – 65 cents for children under twelve, and 95 cents for everyone else – the “It’s a Small World” exhibit and the Pepsi-Cola Pavilion were popular enough to challenge the attendance figures generated by larger, free pavilions. Most accounts of the World’s Fair took note of the exhibit, if only because the feel-good, sight-specific qualities of this children’s tour of the world corresponded closely to the global multiculturalism of the larger affair. Along the route traced by the dinghy, animated dolls, each dressed in racially and culturally specific clothing, and surrounded by regionally distinctive landscapes, sang and danced to the ride’s ubiquitous theme song. A row of French dolls, dressed like showgirls at La Moulin Rouge, danced the “Can-Can.” “Perched high on a camel,” one newspaper noted in a photo spread, “a little Arab boy rides out of the desert.” In another scene, a gaggle of Mexican children sit still, wearing straw hats under an enormous, smiling sun. Racial difference is a critical, enduring feature of the exhibit. Even today, the children of the African continent are silenced; they alone do not sing. Those in the dingy, entering the waters along the “dark continent,” hear only the steady beat of tribal drums, pulsating in tropical harmony with the distant, futuristic world of Disney. A doe-eyed geo-political metaphor, “It’s a Small World” concludes with all of the children of the world, now sharing a home, their once-multi-hued racial costumes now reconceived as uniformly white, singing and dancing together. The song is louder here, the chorus thicker with the sounds of more voices, creating a sense of deep synchronicity. For many visitors, the focus was on the political meaning of that synchronicity, and specifically on the social function of a racialized world brought together on stage. It felt good, many thought, to challenge racism, but also to confirm race. Indeed, despite the pronounced utopian textures, “It’s a Small World” is (and was) so racially aware, so saturated with difference, that a troupe of blind children, brought to the Pepsi-Cola pavilion in the early days of the World’s Fair, left convinced (the New York Times reported) that they could “distinguish some of the colors” along the trip. Joining soundscapes to sightscapes, Walt Disney, American genius, had found a way to let even the blind see race. Such “awakenings” continue to the present, as the ride is among the more popular at the various Disney resorts. “Everything was so colorful and full of detail,” one blogger noted. But the color and detail and the orchestration of diversity into an ensemble are necessary features of the sightline, allowing it to work, to make racial sight possible.